Setting Up Registry From the Galileo Update Site - to set up a target platform from an update site. Service registry expose its interface as http REST service. org.osgi.service.http.port - the port number witch will be used to expose Service Registry as http service. 9001 - the default port that the remote resolver uses to connect to the Swordfish registry. Create folder for Swordfish Registry File Location and change corresponding org.eclipse.swordfish.registry.fileLocation property in launch configuration. 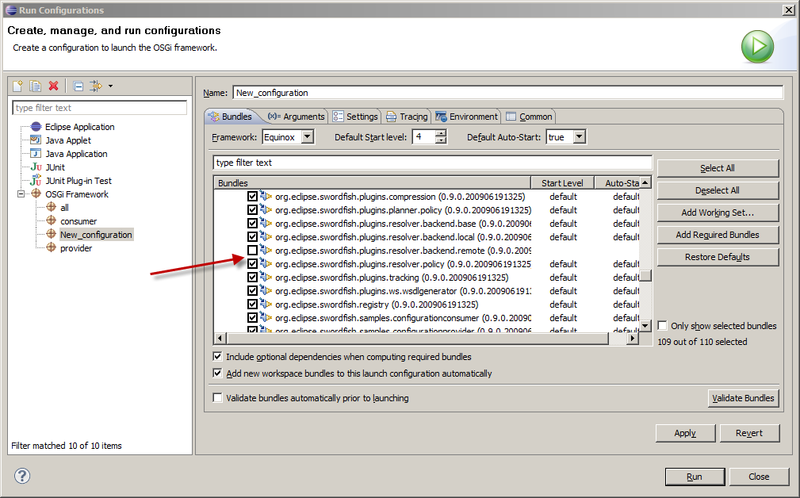 Run new Launch Configuration ant go to http://localhost:9001/registry/wsdl/ URL in your browser. You'll see page with empty table and Swordfish Logo, thats fine because org.eclipse.swordfish.registry.fileLocation property probably points to empty folder. Copy some arbitrary wsdl files to above mentioned folder and refresh web page. org.eclipse.swordfish.plugins.resolver.backend.remote - remote resolver communicate with remote Swordfish registry using REST http calls. org.eclipse.swordfish.plugins.resolver.backend.local - local resolver not executes remote calls and retrieves service descriptions for local folder. By default this is org.eclipse.swordfish.plugins.resolver.backend.local\src\main\resources\wsdl folder. This page was last modified 08:42, 14 August 2009 by Anne Aloysious. Based on work by Sergey Dneprovskiy, Andrey Kopachevsky and Renat Zubairov.